IBS and anemia often go hand in hand. Research shows that roughly one-third of IBS sufferers also have recurring anemia. Both IBS and anemia can cause fatigue, so having both ailments can make it even harder on patients. Here are seven fast facts about anemia and how it relates to IBS. Anemia can be a symptom of irritable bowel syndrome due to the poor absorption of iron, vitamin B12, or folic acid. Being anemic means you have either fewer red blood cells than normal and/or poorly formed red blood cells. Did you know that there are more than 400 types of anemia? 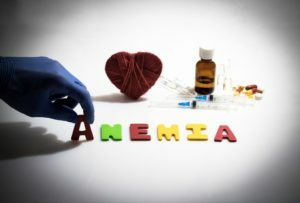 The three most common types of anemia are iron deficiency anemia, vitamin B12 deficiency anemia, and folic acid deficiency anemia. Your RBCs carry oxygen, which means that if your are anemic then your body will not get enough oxygen. Without adequate oxygen, your body can’t function properly and you’ll feel tired. IBS can lead to anemias caused by deficiencies in iron, B12 or folic acid. IBS symptoms of constipation and/or diarrhea can cause problems with the absorption of critical vitamins and nutrients. Iron, B12 and folic acid are critical to your overall health because they are each required to make red blood cells which, in turn prevents fatigue and any associated impairment in cognitive function. A CBC (Complete Blood Count) test can confirm iron deficiency anemia. Patients with anemia will have a low RBC count, low hematocrit (Hct) or low hemoglobin (Hgb). B12 deficiency anemia and folic acid deficiency anemia can also be diagnosed by CBC, which will check for unusually large red blood cells. (In this case, bigger is not better.) And a ferritin test can detect low iron before it leads to anemia. If your anemia is due to the malabsorption of nutrients, then getting control of your IBS will help make you less susceptible to anemia. However, if you don’t raise your ferritin level adequately, then you may be prone to the recurrence of anemia and fall into a continuous cycle of anemia. It is critical to get your anemia under control as part of your IBS treatment plan. #6 What can cause low iron? Iron deficiency is one of the most common nutritional deficiencies in the US. Low iron can be caused by iron loss OR low iron consumption OR the inability to properly absorb iron. Here’s a quick look at why each of these can occur. Digestion or absorption issues – Digestive problems can cause low iron as can absorption disorders. This is most frequently due to IBS, which must be properly diagnosed and treated to address the low-iron problem. Contact us to solve this and to schedule an appointment at the IBS Treatment Center. Increased need for iron – Some women, including pregnant women, need more iron. For someone that has blood loss from heavy periods, an accident, or donating blood too often, more iron may be needed. Low iron consumption – Vegetarian diets or low-nutrition diets may not provide adequate iron or it may not be efficiently absorbed. Consuming caffeinated drinks, excess whole grains and dairy can also decrease the absorption of iron. Self-medication with supplements is common, but iron can be toxic to your liver. If you have symptoms of anemia or iron deficiency, your doctor should measure your ferritin level (the form of iron stored in the liver, spleen, bone marrow and tissues). Measuring ferritin is the optimal way to accurately gauge your iron level so your doctor can determine whether iron supplements are necessary, and how long you should take them. If you are suffering from anemia related to your IBS and testing indicates iron supplements are needed, you should know that not all supplements are equal. Low quality iron supplements (iron oxide and iron sulfate) are poorly absorbed and often cause digestive problems like upset stomach and constipation – with IBS, that’s the last thing you want on top of your other symptoms. High quality iron supplements (iron picolinate, iron glycinate, or iron citrate) are absorbed more efficiently with little or no side effects. 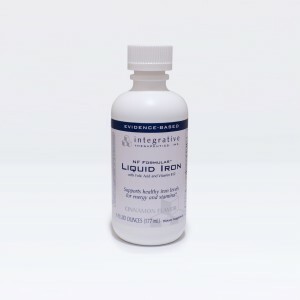 Liquid iron and time release iron capsules are also less likely to cause digestive upset. It is wise to include folic acid and vitamin B12 with your iron supplement, because these nutrients are also required to form RBCs and maintain healthy red blood cells. 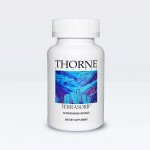 At the IBS Treatment Center, for our patients that suffer anemia and require iron supplements, we recommend Ferrasorb by Thorne or Liquid Iron by ITI. In addition, taking Vitamin C with your iron supplements can significantly improve absorption of this vital nutrient. An iron supplement that contains Vitamin C or a separate Vitamin C supplement can accomplish this goal. To find out more about how the IBS Treatment Center is changing lives of IBS sufferers and people suffering with chronic anemai, contact us now to schedule an appointment at one of our locations in Seattle, WA or Santa Monica, CA. We see patients from all across the country and have helped thousands conquer their IBS. Call 888.546.6283 now.